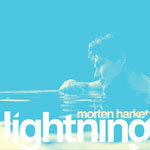 The first single from Morten's "Out Of My Hands" was "Lightning". It premiered on the Norwegian radio station "P4" on 13 February 2012 and will be released in Norway on 9 March 2012. The cover artwork is light blue with a blue and cream-toned picture of Morten's head and arm emerging from the water. "morten harket" and the title are printed in cream and white respectively at the bottom of the sleeve. The track was written by Morten with Joakim Berg and Martin Sköld (Kent) and produced by Steve Osborne and Erik Ljunggren.